For some research projects you may be required to use primary sources. How can you identify these? Journals, magazines, and newspapers are serial publications that are published on an ongoing basis. Many scholarly journals in the sciences and social sciences include primary source articles where the authors report on research they have undertaken. Consequently, these papers may use the first person ("We observed…"). These articles usually follow a standard format with sections like "Methods," "Results," and "Conclusion." In the humanities, age is an important factor in determining whether an article is a primary or secondary source. A recently-published journal or newspaper article on the Brown v. Board of Education Supreme Court case would be read as a secondary source, because the author is interpreting an historical event. An article on the case that was published in 1955 could be read as a primary source that reveals how writers were interpreting the decision immediately after it was handed down. Serials may also include book reviews, editorials, and review articles. Review articles summarize research on a particular topic, but they do not present any new findings; therefore, they are considered secondary sources. Their bibliographies, however, can be used to identify primary sources. Most books are secondary sources, where authors reference primary source materials and add their own analysis. "Lincoln at Gettysburg: the Words that Remade America" by Gary Wills is about Abraham Lincoln's Gettysburg Address. If you are researching Abraham Lincoln, this book would be a secondary source because Wills is offering his views about Lincoln and the Gettysburg Address. Books can also function as primary sources. For example, Abraham Lincoln's letters, speeches, or autobiography would be primary sources. 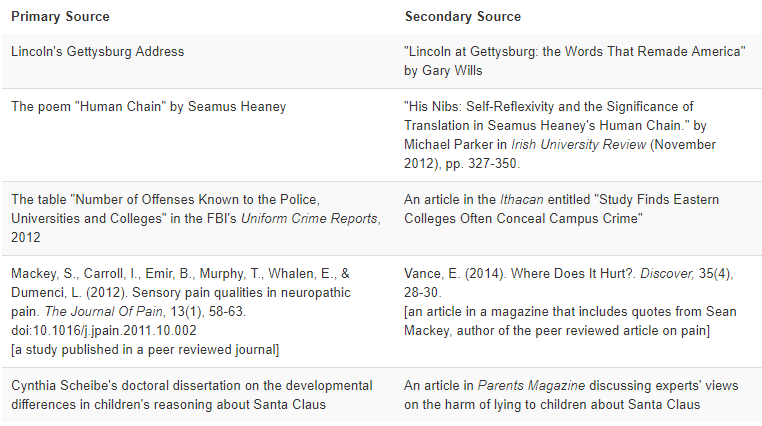 To locate primary sources in the library catalog, do a keyword search and include "sources" in your search. The search results for "Abraham Lincoln" and "Sources" would include include "The Civil War: the First Year Told By Those Who Lived It", a book that includes letters written by Abraham Lincoln. Visual materials such as maps, photographs, prints, graphic arts, and original art forms can provide insights into how people viewed and/or were viewed the world in which they existed. Films, videos, TV programs, and digital recordings can be primary sources. Documentaries, feature films, and TV news broadcasts can provide insights into the fantasies, biases, political attitudes, and material culture of the times in which they were created. Radio broadcast recordings, oral histories, and the recorded music of a particular era can also serve as primary source material. Manuscripts and archives are primary sources, including business and personal correspondence, diaries and journals, legal and financial documents, photographs, maps, architectural drawings, objects, oral histories, computer tapes, and video and audio cassettes. Some archival materials are published and available in print or online. Government documents provide evidence of activities, functions, and policies at all government levels. For research that relates to the workings of government, government documents are primary sources. These documents include hearings and debates of legislative bodies; the official text of laws, regulations and treaties; records of government expenditures and finances; and statistical compilations of economic, demographic, and scientific data. Tertiary sources contain information that has been compiled from primary and secondary sources. Tertiary sources include almanacs, chronologies, dictionaries and encyclopedias, directories, guidebooks, indexes, abstracts, manuals, and textbooks. Want to test your knowledge on Primary and Secondary Sources? Read this guide and then take the quiz! This quiz will test how well you understand the difference between primary and secondary sources.